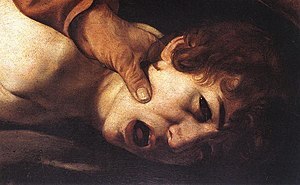 I love art and Caravaggio is one of my favorite artists. 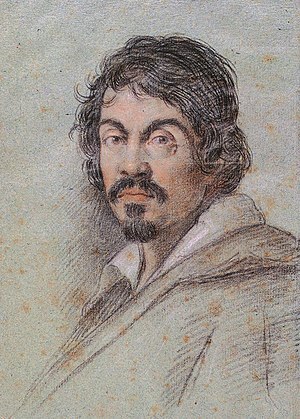 Michelangelo Merisi da Caravaggio was a famous Baroque Italian artist. 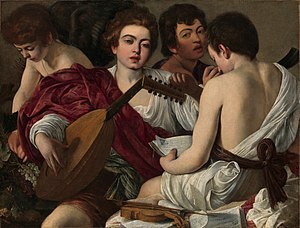 Michelangelo Merisi, named Caravaggio, Italian painter, was born in Caravaggio in 1571 and died in Porto Ercole in 1610. 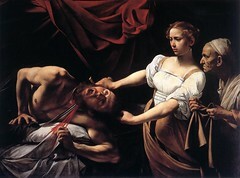 Caravaggio trained as a painter in Milan under Simone Peterzano who trained under Titan. 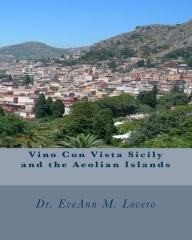 He moved to Rome in his early twenties. 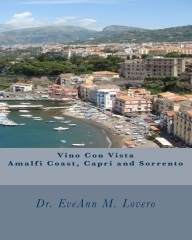 He died at the age of 38 of a fever in Porto Ercole in Tuscany. 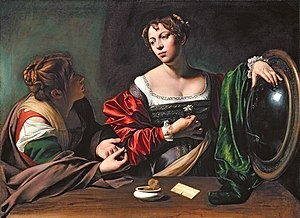 Between 1592, “when Caravaggio arrived in Rome, to the end of Gregory XV Ludovisi’s pontificate in 1623 was one of the greatest artistic period’s of all time.” Many great artists converged on Rome in that period: Caravaggio, Annibale Carracci, Guido Reni and Rubens. 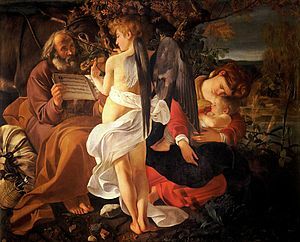 Rome has many of Carravaggio’s masterpieces. 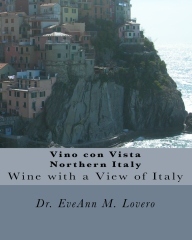 They are on display in churches, museums, places and former residences of nobility. 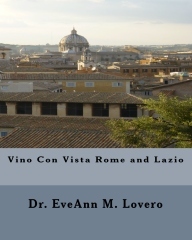 Travel to Piazza Venezia, Piazza del Popolo, Villa Borghese and the Vatican City to view his work. 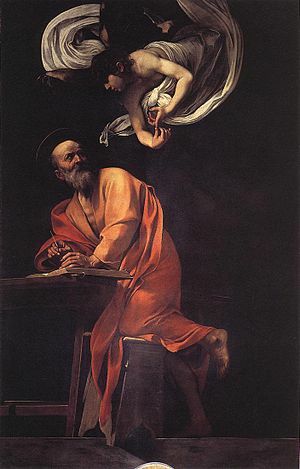 His first public commissions in Rome were about Saint Matthew the Apostle: the Martyrdom of Saint Matthew and the Calling of Saint Matthew. 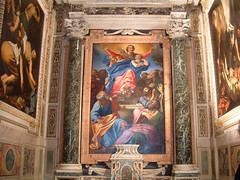 These were completed between 1599-1600 for the Contarelli Chapel in the church of the French congregation, San Luigi dei Francesi in Rome. 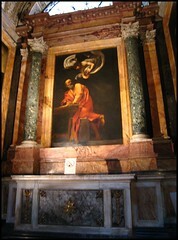 Between these two paintings in the chapel, he also painted The Inspiration of Saint Matthew in the altar in 1602. 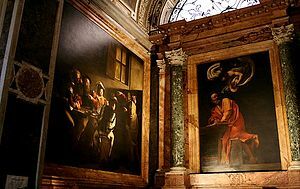 These three adjacent canvases by Caravaggio in the Contarelli chapel represent the story from the Gospel of Matthew. 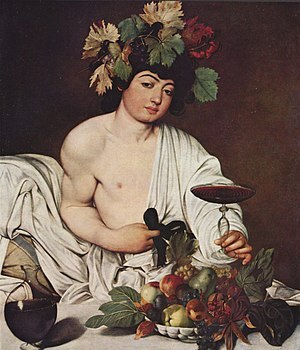 One of my favorite Caravaggio paintings is Bacchus (the Roman god of wine). 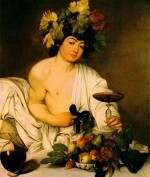 You can find Caravaggio’s Bacchus at the Uffizi Museum in Florence, Italy. 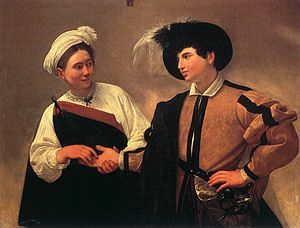 If you want to go on a Caravaggio Treasure Hunt in Rome you can also visit the Galleria Doria Pamphili for more paintings. 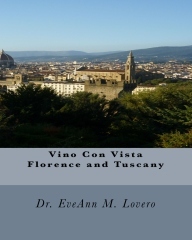 Just a short walk from Piazza Venezia in the Galleria Doria Pamphilj on Piazza del Collegio. 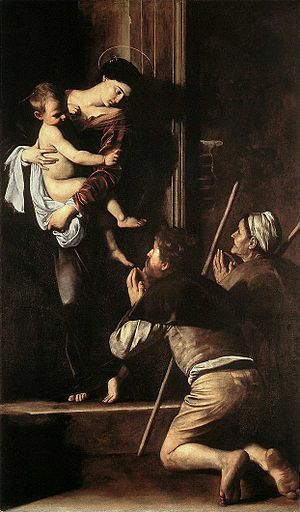 Admire “Riposo dalla fuga in Egitto”, “Maddalena” and “San Giovanni Battista”. 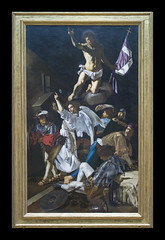 The Borghese gallery (Piazzale Scipione Borghese, www.galleriaborghese.it/ has many pieces; the world’s greatest collection including: “Giovane con la canestra di frutta”, “Bacchino malato”, “San Girolamo”, “Madonna dei Palafrenieri”, “Davide con la testa di Golia” and finally “San Giovannino”. 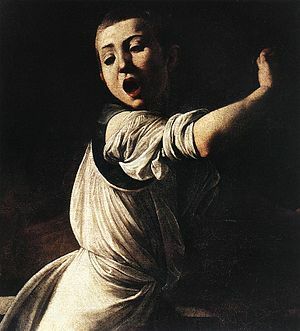 “San Francesco in meditazione” in the church of the Cappuccini Convento on Via Veneto is also attributed to Caravaggio, while the mythical “Narciso” and the “Decapitazione di Oloferne” are in the Galleria Nazionale d’Arte Antica di Palazzo Barberini. 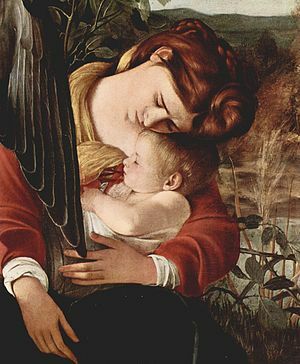 Other masterpieces by the great Lombard artist can be found in the Corsini Galleria on Via della Lungara (“San Giovanni Battista nel Deserto”), in the Vatican Museum (“Deposizione di Cristo”), in the church of Santa Maria del Popolo in Piazza del Popolo (“Converzione di San Paolo” and the “Crocefissione di San Pietro”); in Sant’Agostino on Via della Scrofa (“Madonna dei Pellegrini”). 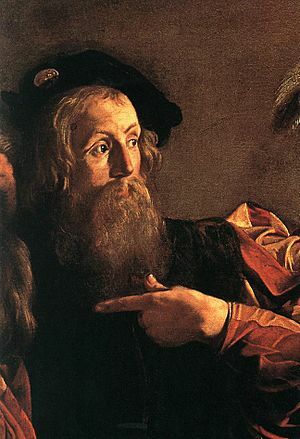 Finally in San Luigi dei Francesi on the piazza of the same name there is a series of paintings which tell the story of Saint Matthew in the Cappella Contarelli of the church, they are: “Vocazione”, “Il Martirio”, and “San Matteo e l’Angelo”. 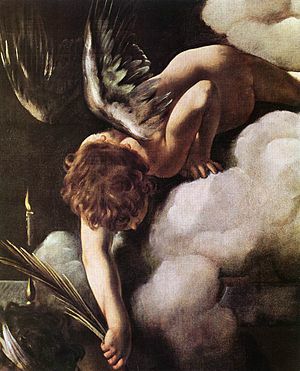 In the Casino Ludovisi, the last remains of the Villa Ludovisi on Via Lombardia, Caravaggio created frescos in oil on the walls of the alchemy laboratory, painting “Giove, Nettuno and Plutone” in triumph around the sun. 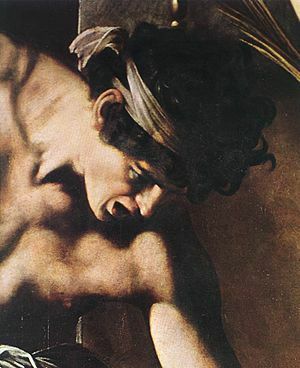 2010 marked the 400th anniversary of Michelangelo Merisi da Caravaggio’s death. 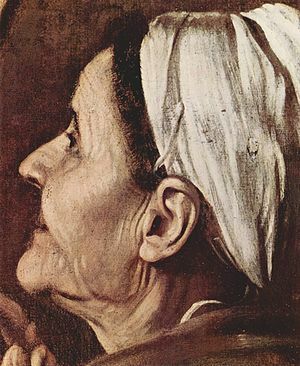 He was 39 when he died and had spent half of his life painting professionally. 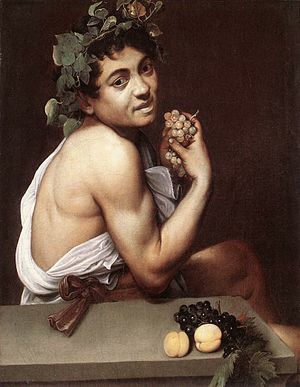 While Caravaggio’s passing came as no huge surprise to his contemporaries, the rest of us have been trying to flesh out his chronology ever since. 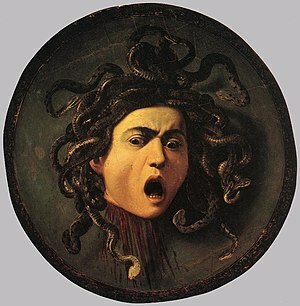 See, when he painted, he painted in bursts and, usually, out of necessity. 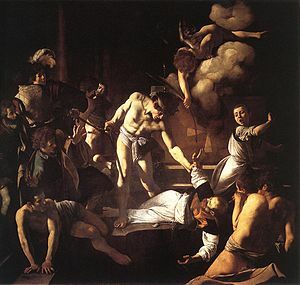 There seem to have been long intervals in between painting bursts when life, flight and threats of imprisonment and/or execution took over. 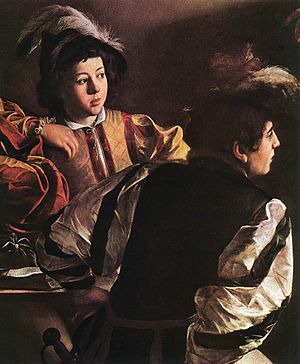 Given the circumstances and doing the math, quite a few too many Caravaggio canvases have surfaced over the centuries to be credible.